I know many of you have iPads (or other tablets) or smartphones. Have you ever thought of using them to make art? There are many, many fun apps that allow you to draw, doodle, “paint” and modify your photos—and a lot of them are free, have free versions, or cost only a few dollars. Digital apps lack the tactile appeal of real art materials, but there’s no mess, and if you’re like me, you may forget your sketchbook, but you usually have your phone. Next time you’re waiting at the dentist or traveling without your sketching materials, try one of these. I’m not going to try to give any sort of comprehensive overview. The folks at Creative Bloq have done that far better than I could. I just want to give you a bit of an idea to get you started. I have an iPad and a Mac, so that’s what I’m able to address personally. The brown and orange lines are drawn with the pen that comes with the free version. 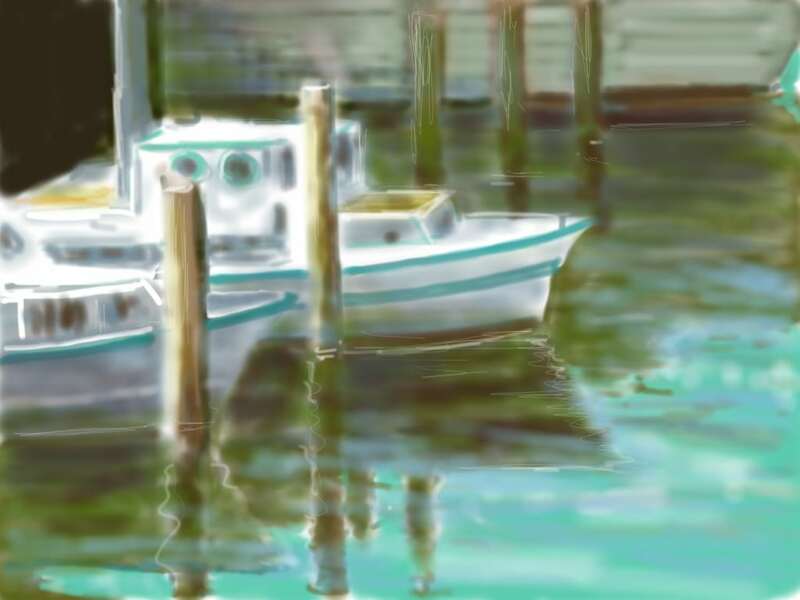 The “watercolor” effects are part of the paid version, but it’s just a few dollars. This one is my all-around favorites, all because of one simple feature: you can “rewind” to an earlier version of your doodle! You simply place two fingers on the screen and move them in a counterclockwise circle—like winding back the clock!—and your drawing slowly “undraws” itself. You can go back and forth until you find just the stage you like best and then continue drawing from there. Wow! Does that ever take the stress out of drawing! I’ve barely scratched the surface of what this app can do, but here’s a link to a great series of how-to articles. For iPad only (sorry!). There is a free version with a very cool variable-width pen tool and some basic colors. Upgrades allow you to add more tools (brush, marker, pencil) and a color-picker so you can use any color you like and build your own palettes. Tap all five fingers on the screen to call up all the controls. Slide a finger up and down to change the size or opacity of a brush. Touch the color wheel to choose a color. The “wet” paint can be blended with another color. A fanciful landscape in Eazel. Great way to try out wild color ideas without using up any paint. 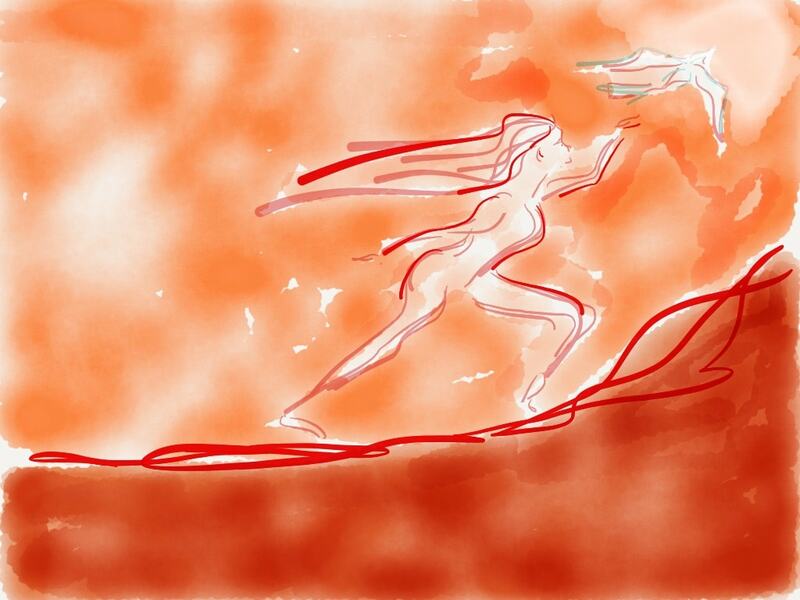 A free, and pretty powerful, version of Sketchbook Pro. This one takes a little longer to learn, but is probably the most powerful of the three. I often use this one to do planning sketches for paintings, because I can “erase” and cover up things so easily. 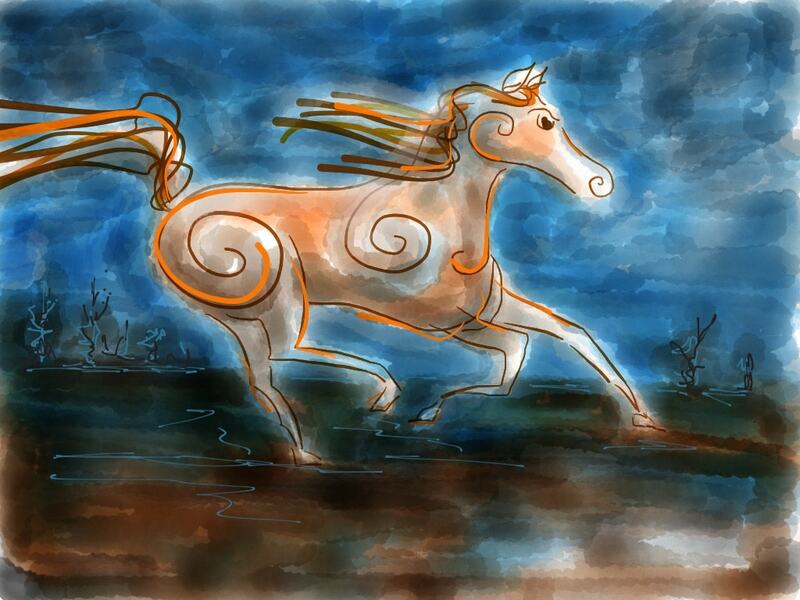 It allows me to get a watercolor look, but with almost infinite ability to make changes. Makes planning fast and easy (so I actually do it!). Nice for drawing and doodling, too—no stress! 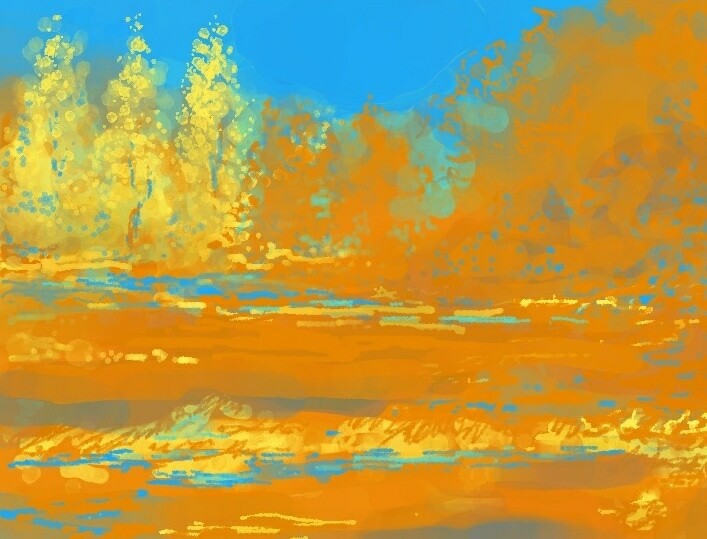 Digital painting using Sketchbook Express. There are tons of photo filter apps out there. I really like the ones that take a photo and simplify the shapes in some way. This not only results in some fun photos, it helps me see the big, connected shapes that help make a drawing or painting hang together. This one doesn’t seem to do much, but what it does is usually pretty cool. Choose a photo (or take one), and then choose a color scheme by selecting two colored “popsicles”. 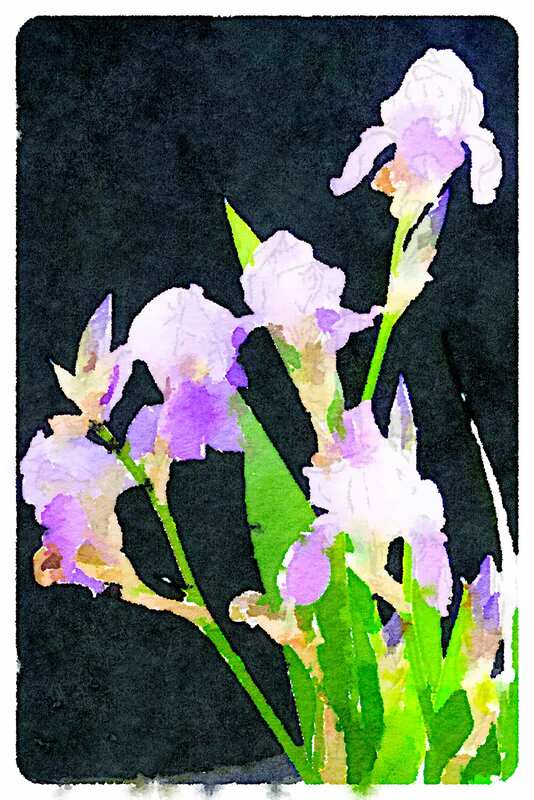 The app reduces your photo to a “line-and-wash” drawing using those colors. 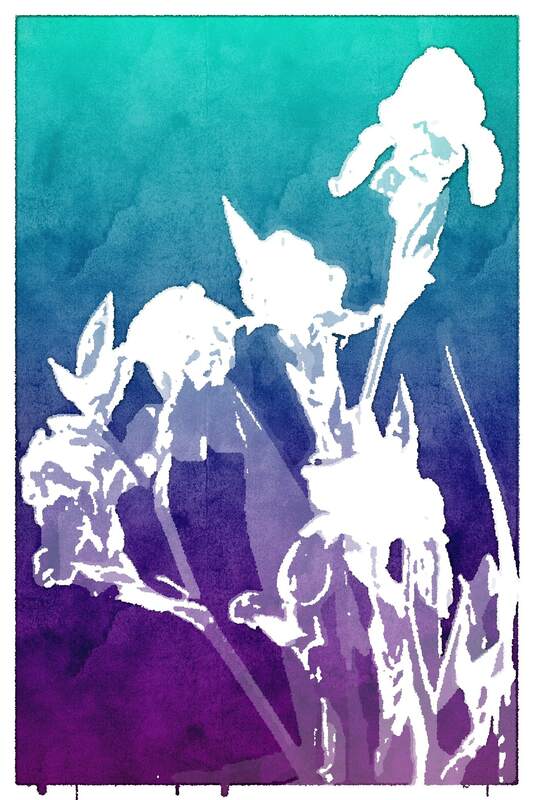 A photo of irises processed by Popsicolor. Makes it really easy to see just the big shapes! Choose (or take) a photo and let Waterlogue do its thing. There are a bunch of variations, but I think the default one is usually the nicest. I’ll say no more, and let the results speak for themselves. The same photo, processed with Waterlogue. If you don’t try any of the others, this one is really worth a try. As any photo app, it works better with some photos than others, but I’ve seen some of people’s grandkids and pets that were really hard to tell from actual paintings!